Aamir Khan-starrer Dangal, that has scripted history in China by becoming the first top-grossing non-Hollywood film, earned rare praise today from a top Chinese leader who lauded it for being a "success story" which needs to be highlighted by the media in BRICS nations. "If I remember it correctly, there is a movie in India 'Wrestle my father' (Chinese name for Dangal), is very popular in China in a very short time," with record revenues, raking up more revenue than Chinese movies, Liu Yunshan, a ranking leader of the ruling Communist Party of China (CPC), said while addressing participants of the BRICS Media Forum being held here. "Dangal is the most successful movie in recent years," said Liu, who is ranked fifth in the all-powerful seven-member Standing Committee of the CPC which rules the country. "I think this is a very typical example of a success story. We media groups need to give it more coverage. This will serve as a good example," he said. For example, the Indian media should be proud of this movie because it is very successful in China and very influential, he said. "Perhaps we should take this opportunity to express our voice," he said, adding that "we need things which are helpful, conducive and constructive for sure". Editors and journalists from Brazil, Russia, India, China and South Africa (BRICS) are attending the forum being organised by China's Xinhua news agency ahead of this year's BRICS Summit to be held in the Chinese city of Xiamen in September this year. 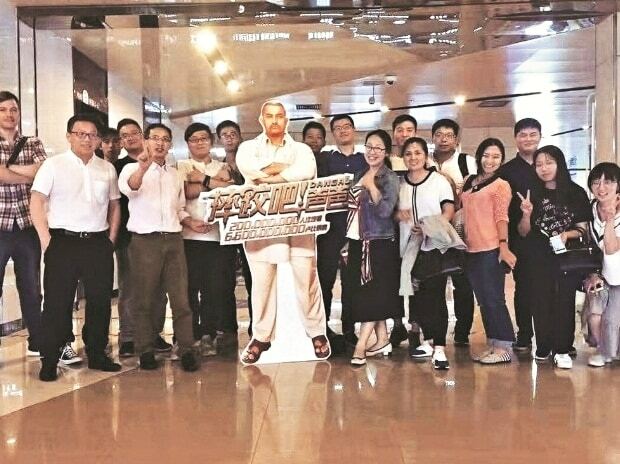 Dangal which raked up over Rs 1,100 crore since it was released in China on May 5 has created history by becoming only the 33rd film in China's history to cross RMB one billion. It is still continuing to play over 7,000 screens across China. Liu, in his address, also attacked the western media, saying that it is spreading the fake news in the past few years. "There has been a lot of fake news in the western media. Like President Vladimir Putin said some countries actually created those fake news," he said. "Mainstream media in BRICS countries must strengthen efforts to disseminate more positive news about BRICS countries and we can convey more positive energy. This is our responsibility," Liu said. He also claimed that media in China which is state- controlled enjoys freedom. "In China, I don't think (there is) any problem with media freedom...China has negative news in the past," he said. "In the western world, there is fight against fake news," Liu said apparently referring to the allegations by US President Donald Trump against the media. He also said traditional media in BRICS countries should catch-up with the western media and strengthen mutual beneficial cooperation, assistance and learning. Liu suggested an exchange of professionals, mutual interviews and technological cooperation among the BRICS countries. Mainstream media in BRICS countries need to express common voice telling good stories from BRICS countries, he said. The media should also fight the pessimistic outlook being spread by the western media. Also, some international rating agencies are downgrading credit ratings of the BRICS countries. It is being done because "they believe we are not promising. Because they don't believe in our future". A BRICS media joint photography exhibition has also been organised on the sidelines of the two-day forum which will conclude tomorrow.